Sonetics wireless headsets reduce unimportant noise and connect you with the people and the important things you need to hear – completely hands-free. Teams are connected and more productive, work is less stressful, safety is improved and the day is a lot more enjoyable. Up to an impressive 1,600 feet from the ComHub, our team wireless systems cover job sites large and small. Connect Sonetics headsets with your portable radio to go even further. 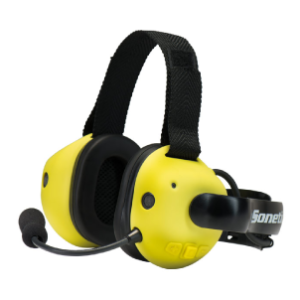 Delivering day-long comfort and rugged, anywhere performance, the Sonetics APX372 Listen-Through Advanced Hearing Protector with personal sound dosimeter shields you from dangerous noise levels while enhancing other audio to comfortable listening levels. 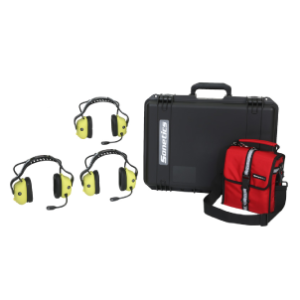 Conserve your hearing without sacrificing safety and situational awareness. 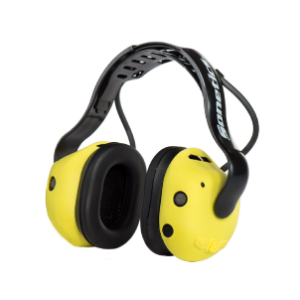 Stereo Listen-Through lets you hear alarms or have a face-to-face conversation without removing your hearing protection. Connect your portable two-way-radio, cell phone or listen to an MP3 player via the wired auxiliary input. Watertight and verified and validated to perform in extreme environments, the APX372 protects your hearing while you get the job done. Powered by the latest DECT7 wireless technology, the APX377 connects you to team members in full-duplex conversation, just like a conference call. No delays, no buttons to push and no clipping or interference. Multi-channel capability lets multiple teams operate simultaneously in the same work area. Push-to-talk or monitor virtually any portable two-way radio via a direct-wire cable connection (wired portable radio adapter required, radio not included). Noise cancelling and auto-leveling microphones ensure you are heard clearly as you move from low- to high-noise areas. Stereo Listen-Through situational awareness lets you hear your surroundings and have face-to-face conversations while protected from dangerous noise levels. Watertight and verified and validated to perform in extreme environments, the APX377 has advanced protection for your hearing while you work. Sonetics’ next generation portable wireless systems offer a complete solution for effective communications in demanding conditions. Up to 10 Apex APX377 or APX379 (with Bluetooth) wireless headsets and a battery-powered portable DECT7 ComHub™ are enclosed in a waterproof Pelican™ charging case for easy transportation and storage. The ComHub interfaces with virtually any two-way radio using a Sonetics Portable Radio Adapter cable. Systems include all necessary chargers and components (2-way radio sold separately). 12V or 120/240V charging options for in-vehicle or facility charging flexibility. Featuring Stereo Listen-Through – We’ve found the most common issue with hearing protection is the isolation users feel when wearing them. We added Stereo Listen-Through to all of our Apex 3-Series headsets to enable users to gain critical situational awareness.